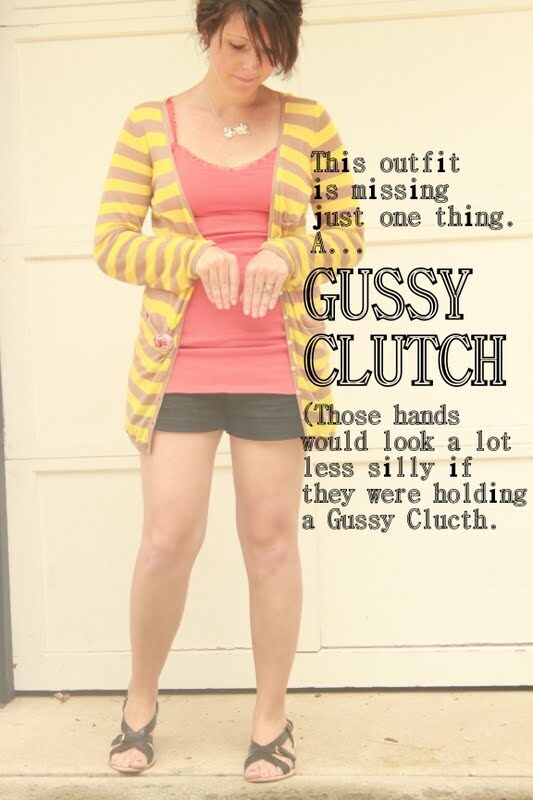 Head on over to Gussy Sews and check out her adorable clutches! Then...Come back here and (in the comment section below) tell me whcih one you think I should chose to go with THIS outfit! BONUS: All comments here will count as an EXTRA ENTRY in the Gussy Sews giveaway (you could win a 30$ shop credit to GUSSY SEWS...cheer cheer cheer!). Psst...entries end tonight at midnight. Definitely the tangerine dot clutch! It is totally cute and would be the perfect accessory to your adorable outfit!! I think the "Spring Pink Wristlet" Would look super cute! the round damask would be my pick...i am loving mixing floral with stripes this spring/summer. that cardi is super cute, btw! I think the vintage rose clutch would look super cute. Some light green accent with that outfit would look awesome. Definitely the round damask clutch! So cute! The vintage romance clutch would go with everything! The daisy clutch of course. Cute yellow ruffle with different color daisies that would compliment any outfit. Def go for the daisy clutch.